The Nature Center’s Monona Campus showcases innovative renewable energy systems, building techniques, and sustainable practices and initiatives including use of solar energy, water efficiency systems, sustainable siting, and more. Visit us, inquire about a green tour of our building and grounds, or check out the links below to learn more about each category. And, because a building is only as green as its occupants, we encourage our staff and visitors to practice sustainable habits and behaviors too. Actions like biking, recycling, composting, powering down electronics, and turning out lights can all add up to make a big difference! ALNC was honored in October of 2014 to receive the 2014 Sustainable Small Business of the Year award from In Business magazine in recognition of our numerous and ongoing green building initiatives. The In Business Sustainability Awards program honors Madison-area companies making significant eco-conscious business decisions. As part of our ongoing sustainability efforts, the Aldo Leopold Nature Center became one of Sustain Dane’s 2014 MPower Business Champions, after completing a one year program for businesses and organizations in the Madison area that want to become more sustainable and reduce their environmental impact, while saving costs. Since the program began in 2009, over 75 area business and organizations have completed the program. Executive Director of Sustain Dane, Jessie Lerner, said that the MPower Business Champions “represent the top tier of environmental and social leadership among the Madison Region’s business community”. 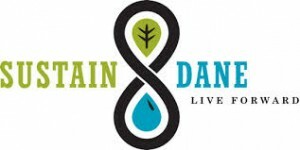 We are incredibly excited to be a part of this great program and enjoy working with Sustain Dane. It has enabled us to find even more ways to become a more sustainable organization and begin working on all kinds of new and exciting green initiatives.